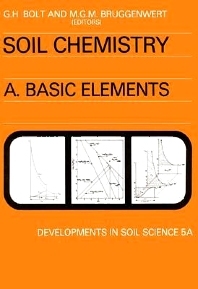 Developments in Soil Science, 5A: Soil Chemistry: A: Basic Elements focuses on the advancements in the processes, methodologies, principles, and approaches involved in soil chemistry. The selection first elaborates on the composition of the soil, chemical equilibria, and surface interaction between the soil solid phase and the soil solution. Topics include properties of the liquid layer adjacent to the solid phase, influence of the interaction between solid and liquid phase on soil properties, reactions involving the transfer of protons and/or electrons, calculation of equilibrium constants from thermodynamic data, solid phase components, and gas phase. The manuscript then takes a look at the adsorption of cations and anions by soil, common solubility equilibria in soils, and transport and accumulation of soluble soil components. Discussions focus on solute displacement in soil, transport with and in the liquid phase, iron oxides and hydroxides, carbonate equilibria, anion exclusion at negatively charged surfaces, and highly selective adsorption of cations by soil. The text ponders on the pollution of soil, saline and sodic soils, and chemical equilibria and soil formation, including weathering and soil minerals, reverse weathering, sodication of soils upon irrigation, chemical aspects of the reclamation of saline and sodic soils, and recognition and prediction of soil pollution. The selection is a valuable source of data for researchers wanting to study soil chemistry.